There is little doubt that St. Patrick's Day is every beer fans favorite holiday. It has been widely estimated that Americans will consume around 5.5 million pints of Guinness on that day! In fact, nearly 1% of all the beer consumed during the calendar year is consumed on that day alone. Crazy numbers! 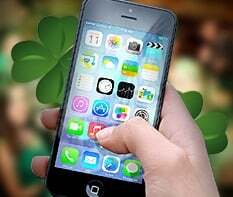 Undoubtedly, along with the festivities of St. Patrick's Day, there are many ways that your phone can be damaged while trying to take a selfie at the bar or while uploading a picture of your green beer to Instagram. And if you end up having one too many of those green beers, the odds of accidental damage sky-rocket! Below we have provided tips to keep your cell phone damage-free during all the festivities on March 17th. 1. Don't leave your phone out on the bar! There are multiple risks that come with this common practice. In today's culture it is perfectly normal to set your phone out in front of your face at a table or bar. Think about the risks, though, your phone can be stolen, dropped or even become a victim of a beer spill. None of which, are preferred outcomes. 2. Keep your phone out of the hands of others. During the celebration it is really easy to misplace or lose your phone. If you are passing your phone around to have someone take a picture of you or to simply just show someone something, you are increasing the risk of something happening to your phone that is out of your control. The combination of drinks and devices isn't exactly a match made in heaven. In a survey on cell phone damages for college students, 10% of the males in the survey claimed they were "too intoxicated" to remember exactly how their phone got damaged or lost. 1 The feeling of trying to remember who last had your phone or where you last had it can be miserable. Do your best to avoid that all together and keep your phone in your possession! 3. Use both hands when trying to snap pictures. Not much would be worse than reaching out to take a picture and dropping your phone over a barrier onto the road during a parade, for instance. There are numerous issues that can result from this. Who's signing up for any of these accidents? Not me. The more support the better! Of course, though, accidents do happen and some damages can be unavoidable. Relying on the luck of the Irish probably isn't your best strategy. If you want to truly give yourself peace-of-mind going into St. Patrick's Day, get yourself a free quote on cell phone insurance from Worth Ave. Group and protect yourself from the headache of high cost repairs and replacements. We cover all types of accidental damage that you might face during the activities, so don't wait! Visit here for a quote on cell phone insurance or visit this link to get insurance for your iPhone. Be safe and have an excellent St. Patrick's Day!